Whatever we think about floor cleaning and floor maintenance, we all can agree the they're essential in keeping our floors looking new longer, not to mention reflecting pride in our homes, and, of course, contributing to our quality of life. That's why Mohawk created Floor Care Essentials, a revolutionary floor care system for all hard and soft surfaces in your home. Contact Us If You Are A Licensed Dealer That Would Like Your Business Listed. Best of all... it's a complete cleaning system brought to you by the worlds largest manufacturer of flooring, Mohawk, the name you have trusted for over 125 years. 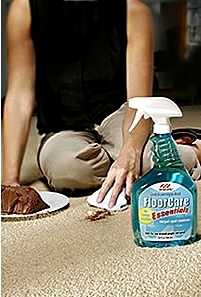 Multi Hard Surface Cleaner 24 oz. Pet Odor & Stain Pretreatment 96 oz. Pet Odor & Soil Remover 96 oz. The result of years of research and development, not only are these products indispensable for regular floor cleaning and maintenance, they're also essential for spill and stain emergencies. Mohawk Floor Care Essentials works on both wet and dry spills, and you can use them on other surfaces, too, like countertops, upholstery, drapes, tile and grout. Information on Mohawk Floor Care Essentials, Mohawk Floor Care, Mohawk Carpet Care Cleaners, Mohawk Hardwood Floor Care, Mohawk Showrooms, Mohawk Carpet Dealers offering a fine selection of Mohawk Flooring Products. Serving information to Brodheadsville, Tannersville, Stroudsburg, Poconos, Hazleton, Lehigh Valley, Allentown, Bethlehem, Easton, Nazareth, Wilkes Barre, Scranton, Monroe County, Pike County, Carbon County, Luzerne County, Lehigh County and all of Northeast Pennsylvania, PA, 18322, 570, 610, 215 area codes. Offering the finest information on ceramic tile, porcelain tile, imported tile, tile contractors, tile stores, tile dealers, area rugs and specialty flooring. Mohawk, Shaw, Daltile, Delconca, Saloni, BR-111 flooring, Homer Wood TM flooring, Oshkosh flooring, Century flooring, Harris Tarkett, Witex, Karastan Carpet, Mohawk Carpet, Shaw carpet, Shaw area rugs, Floor Care Essentials and information on Dust Free Hardwood Floor Refinishing. Flooring Information Resources & More! *Note: While we may list, mention, link or otherwise, any manf., retailers, wholesalers, installers, we accept No Responsibility to whomever you may choose. These are only suggestions and it is up to you to investigate and choose who you deal with.